Open a topographical map of <?xml:namespace prefix = st1 ns = "urn:schemas-microsoft-com:office:smarttags" />China, and look at the lower left side, you see a large piece of brown land, shaped like the body of an ostrich. This is the Qinghai-Tibet Plateau - “the roof of the world.” It is a pure and mysterious place with many world-famous high mountains: the Himalayas on the southern rim of the plateau deserve their name “king of mountain ranges.” Towering over the middle of the Himalayas at 8,848.13 meters is Jomolangma (Mount Everest), while at the western end is Nanga Parbat (8,125 meters) in Kashmir and at the eastern end rises Namjag Barwa (7,787 meters) in southeastern Tibet. The Yarlung Tsangpo River, the Mother River of the Tibetan people, flows from west to east between the Himalayas and the Gangdise-Nyanchen Thanglha mountains. This is an international river; it runs by way of Bashika into the plains of India, where it is named the Brahmaputra. Where the Yarlung Tsangpo flows round the Namjag Barwa, the highest peak of the eastern end of the Himalayas, it forms a large horse-shoe bend, thus creating a large canyon, 504.6 kilometers-long, on the southeastern side of the Qinghai-Tibet Plateau. This canyon has become a large opening via which warm and humid air currents from the Indian Ocean reach the Qinghai-Tibet Plateau. This is a mysterious green canyon, the biggest in the world and is called the Yarlung Tsangpo Great Canyon. 5. The Colorado River Canyon, in the USA, 2,133 m deep. Some scholars put the Colorado River Canyon as 12th. The list is as follows: (1) the Yarlung Tsangpo Great Canyon in China, (2) the Kali Gendaki Canyon in Nepal, (3) the Korka Canyon in Peru, (4) the Hutiaoxia Canyon in China, (5) the Nujiang River Canyon in China, (6) the Piraya Canyon in Bolivia, (7) the Lancangjiang River Canyon in China, (8) the Yurik Canyon in Mexico, (9) the New Flosha Canyon in Mexico, (10) the Batopilas Canyon in Mexico, (11) the Kopol Canyon in Mexico, and (12) the Colorado River Canyon in the USA. In the past, geography textbooks and some dictionaries regarded the Colorado Canyon as the world’s biggest. However, in terms of depth it should have been listed behind others. This reflected that people’s knowledge of natural geography was inadequate. Furthermore, there were neither enough works nor thorough comparative studies of the subject. The Yarlung Tsangpo Great Canyon is located at the lower reaches of the Yarlung Tsangpo River and traces a big U-bend around the 7,778-meter-high Namjag Barwa at the eastern end of the Himalayas. The canyon is indeed the biggest in the world, being 504.6 kilometers long, 6,009 meters deep at its deepest point, and 34 meters wide at its narrowest point. With an average elevation above 3,000 meters and nine vertical natural zones that range from high mountains and ice-snow zones to valleys and tropical forests, the canyon exhibits almost every possible type of vertical natural zone. In addition, the canyon is home to two thirds of all known higher plants, half all known mammals and four fifths of known insects in the Qinghai-Tibet Plateau. It is indeed a place of superlatives. Since 1994, when the Yarlung Tsangpo Great Canyon was confirmed as the world’s largest, the Chinese government has paid much attention to the world-level canyon and taken three measures. Firstly, as approved by the State Council in October 1998, the canyon’s original name “the Daguaiwan (Great Bend) Canyon of the Yarlung Tsangpo River” was changed to “the Yarlung Tsangpo Great Canyon” or “Yarlung Zangbo Daxiagu” in romanized Chinese. Secondly, Chinese cartographers of the State Surveying Bureau confirmed the Yarlung Tsangpo Great Canyon as the Number One canyon in the world in February 1999. The bureau declared at a press conference that the Yarlung Tsangpo Great Canyon, between Pai Village in Menling County to Bashika of Metok County in Tibet, was 504.6 kilometers long; that it was 6,009 meters deep at its deepest part (at Zongrong Village between Namjag Barwa Peak and Milile Peak, 7,787 meters and 6,050 meters high respectively); that its average depth was 2,268 meters and the narrowest part of the river at the bottom was 35 meters across; that its average current velocity was 3.23 meters per second and highest current velocity 12 meters per second. 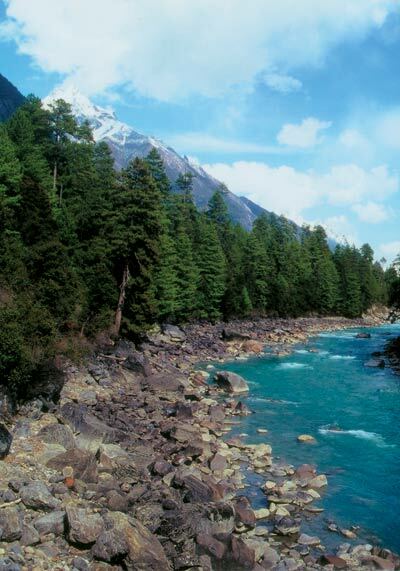 Thirdly, as approved by the State Council in April 2000, the Metok Nature Reserve under state-level protection was renamed as the Yarlung Tsangpo Great Canyon Nature Reserve under state-level protection. The reserve’s total area was 916,800 hectares, ranging from 29o05'.N to 30 o20'.N latitude and from 94 o39'.E to 96 o06'.E longitude. Academicians of the Chinese Academy of Sciences also thought highly of the discovery of the world’s grandest canyon. The brilliant scientists Yang Yichou and Gao Dengyi made great contributions to the discovery of the Yarlung Tsangpo Great Canyon. As for myself, as a Xinhua News Agency correspondent, with a journalist’s powers of observation and spurred by a sense of duty, I promoted the scientists’ study of the canyon, playing an important role in publicizing the achievements of the discovery as part of the process of confirming the Yarlung Tsangpo Great Canyon as the biggest one in the world. A Sino-Japanese scientific exploration team went to the Yarlung Tsangpo Great Canyon in October 1993. Two Japanese members of the team, Takei Yoshitaka and Tadano Yasushi, were in a boat on the river but it was capsized by strong currents as soon as it went out into the main stream and the two were washed away. Tadano Yasushi was rescued but Takei Yoshitaka was not found even after a month of searching. Finally, he was declared “missing.” The Southern Weekend Newspaper asked me to make a report about the exploration of the Yarlung Tsangpo Great Canyon. So I borrowed and read some relevant articles, one of which particularly grabbed my attention; this was “A Preliminary Probe into the Vapor Passage in the Lower Reaches of the Yarlung Tsangpo River Valley” written by Gao Dengyi, Yang Yichou and Li Bosheng, scientists with the Chinese Academy of Sciences and published in Chinese Science, August 1987, vol. 8B. According to the article, the Yarlung Tsangpo Great Canyon was several hundred kilometers long and had an average depth of over 5,000 meters. My journalist’s nose told me that this was a piece of important scientific news of a significant discovery by Chinese scientists. The American Colorado Canyon, considered the biggest canyon in the world, is only about 2,000 meters deep, so the Yarlung Tsangpo Great Canyon was probably the deepest one. I immediately told Gao Dengyi and Yang Yichou about my bold assumption, and asked them to cooperate with me to prove it. So, the scientists involved all threw themselves into the investigation. A conference was held at Zhongguancun in Beijing on April 16, 1994 to discuss whether the Yarlung Tsangpo Great Canyon is the biggest canyon in the world. Academician Liu Dongsheng, Gao Dengyi, Yang Yichou and Zhang Jiming attended the conference. At the conference the Yarlung Tsangpo Great Canyon was, for the first time, proved as the world’s biggest. The next day, April 17, I announced this great geographical finding to the world through the Xinhua New Agency. From that time on the Yarlung Tsangpo Great Canyon has become known as the biggest canyon in the world. The discovery that the canyon was the world’s biggest made many people want to visit it and see its magnificence. Their wish is easy to realize. There are air services from Beijing, Chengdu and Chongqing to Lhasa, from where one makes the onward journey to the Yarlung Tsangpo Great Canyon, but first one must acclimatize to life at this altitude. Lhasa is more than 3,700 meters above sea level and such a high elevation is not suitable for those with high blood pressure and dizziness. Even those who are healthy must rest more, eat less, move less and speak less at Lhasa so as to have enough physical energy for the trip from Lhasa to Bayi town in Nyingchi County. From Bayi to the Yarlung Tsangpo Great Canyon, visitors can take the following routes. After crossing the Gangga Bridge over the Yarlung Tsangpo River and reaching Pai in Menling, you can take either of two routes to the canyon - the eastward route leading to the Yarlung Tsangpo Great Canyon, or the southward route leading to Metok Canyon, a section of the Yarlung Tsangpo Great Canyon, by way of the Doshong La Pass. Heading eastward on the Sichuan-Tibet Highway, there are four possible routes southward to the Yarlung Tsangpo Great Canyon. 1. From Pelung Village along the Parlung Tsangpo Great Canyon, you can reach Zachu, entrance to the Yarlung Tsangpo Great Canyon. This will be adequate for ordinary visitors if they do not have much time or money. 2. Going from Gushiang in Bomi County via Gushiang Lake and Sui La Pass, you can reach Jarasa on the edge of the Yarlung Tsangpo Great Canyon. 3. Going from Bomi County along the damaged Bomi highway, you can reach Metok. 4. Taking the Dashing Bridge over the Parlung Tsangpo River and the Jingdrol La Pass brings you to Tagmo on the edge of the Yarlung Tsangpo Great Canyon. If you take the Sichuan-Tibet Highway from the Sichuan or Yunnan direction, you can also get to the Yarlung Tsangpo Great Canyon by turning south at Bomi or Pelung.